I can be organised when I want to be – but I’m often feeling stressed by the ever-expanding list of things that I “have to do” – but plenty of things drop off my radar. I’ve tried plenty of apps (Asana, RTM, Outlook flags, Evernote, iOS Notes, etc.) but I don’t have a “system” that brings it all together. Everybody raves about David Allen’s Getting Things Done (GTD) system – so it’s time to give it a crack. Exactly what I expected – a system to stop things dropping off my radar. 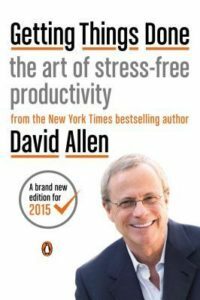 I’m not going to go into the detail on the system – that’s what the book and the internet are for – but David Allen’s system is centred around getting all the loose ends flapping around in your head OUT of your head and into the system. You then process them through it by deciding on the “next action” for all and arranging by the context in which the next action can be completed. This next action is a concrete activity – something your crocodile brain can just pick up and run with, not having to decide each time you look at your list and ignore because it’s too hard. He advises that most people need a couple of days with an empty schedule to get everything into the system and get started. My current recommendation is to read through the full book so you know what you are dealing with – and then you can start it all over again when you are ready to implement. An orientation read-through would also hopefully remove the distracting pull of all the sidebar quotes – which is my only frustration with the book. I kept on wanting to go and read the sidebar quotes and would rush through a paragraph to get there! Frustratingly, it’s more what I didn’t get out of the book that still leaves me hanging! Allen gives you the system but not a specific implementation. Actually, that’s not quite true. He does give an implementation – just one that has its grounding in the most basic of supplies that we have – pen, paper, diary, filing cabinet, file folders. It’s rooted in the physical world. This 2015 edition gives plenty of air-time to the myriad digital inputs and organising locations we all now have, but stays short of recommending – or even naming – specific digital tools (presumably to keep the system relevant to those without the means to use them). So, What’s the next action? Four, actually. Which in GTD terminology, makes it a project. Schedule time to capture all the loose ends into my “In” tray.